NASA's Chandra X-ray Observatory, scientists have discovered the largest wave of ultra-hot gas ever rippling through the Perseus galaxy cluster. Studying this phenomenon can teach us more about the universe. At around 200,000 light-years across - twice the size of our own Milky Way galaxy - researchers suspect it's the largest wave ever discovered in the known Universe, and it's most likely been rolling through space for billions of years. Using data from NASA's Chandra X-ray Observatory, researchers have now found evidence of the most massive example of one of these waves to date. The Perseus galaxy cluster is located in the Perseus constellation around 240 million light-years away, and is around 11 million light-years across, made up of a number of galaxies surrounded by a vast cloud of scorching hot gas that's so hot it only glows in X-rays. While studying X-ray images of the Perseus cluster, researchers saw something odd - a strange 'bay' shape that kept appearing without any clear origin. At first they thought it might have something to do with a black hole in the region, but using data from NASA's Chandra X-ray Observatory combined with radio observations and computer simulations, scientists have now discovered that this 'bay' shape is actually a giant wave. "We think the bay feature we see in Perseus is part of a Kelvin-Helmholtz wave, perhaps the largest one yet identified," said lead researcher Stephen Walker, from NASA's Goddard Space Flight Centre. "Perseus is one of the most massive nearby clusters and the brightest one in X-rays, so Chandra data provide us with unparalleled detail," said Walker. "The wave we've identified is associated with the flyby of a smaller cluster, which shows that the merger activity that produced these giant structures is still ongoing." 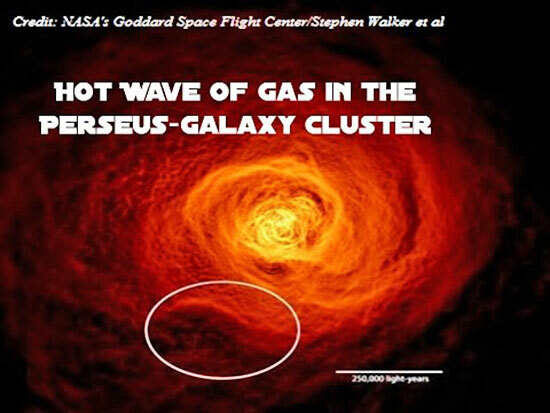 Getting more insight into how waves in galaxy clusters such as Perseus form and evolve doesn't just help us understand our Universe, it also allows the researchers to get an idea of the strength of the cluster's magnetic field. If it was too weak, the wave would be much bigger than the one we see today. If it was too strong, it wouldn't form at all.